I decided to play a game on the Europe 1900 map, but couldn't abide using an Isometric tileset on a map that was clearly rectilinear. This meant I needed to venture outside of the comfortable Amplio2 tileset that is FreeCiv's pride. Not only that, but I needed to enter the world of Square Tilesets, of which there are but a few. I first looked at Trident, but it was just too tiny and too rough for me to imagine actually playing a GAME with it. Then I found the Chess tileset which although it was nice and fancy, I need SOME color in my life! But it's size looked about right, and I thought maybe if I could replace or modify some of the textures, it would be serviceable. So I took it upon myself to modify Sextant into a form that I could tolerate actually using in a game. I got pretty far in my beautification, then got stuck, then dropped the project. And then one year later I thought "Why did I never finish that Europe 1900 game?" So I loaded it up and saw the graphics and remembered "Oh yeah, that's why." So I got back to work copy/pasting sprites from other tilesets, editing existing sprites to make them prettier, and making my own sprites where required. And I have finally managed to create something where I can look at it and say: "Yeah, I could probably play on that*"
*Note: I have not yet actually played on it yet. Just looked at it a bunch. I have some pictures to share and then some questions to ask. 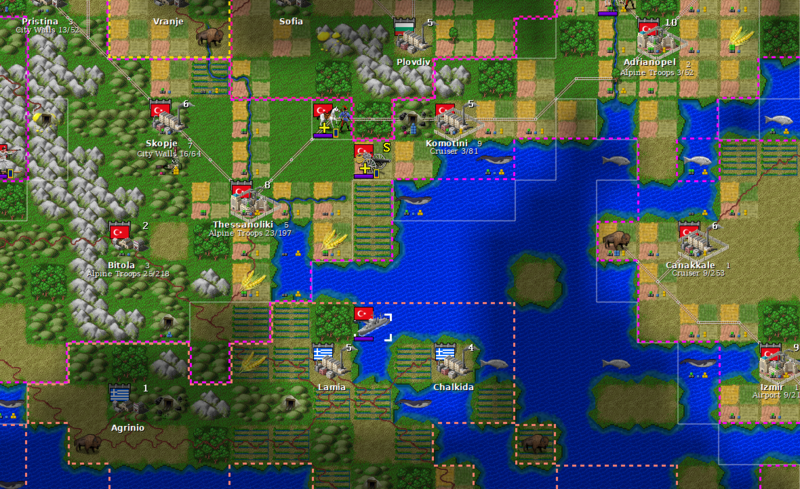 Here you can see my lovely Farmland, National Borders, all-new Riot graphic, and custom Tile-yield Icons. Here you can see my lovely Irrigation, a warmer color tone for the Plains, and the truly wondrous way that the Amplio2 cities get their corners clipped off. How should I go about sharing this? Put a zip file up somewhere to download? Put it on the wiki? I've tinkered with just about every image-file in the pack, and have thoroughly lost track of what I have or have not touched. How can I get my attributions straight? How does this compare to Sextant 2.6? I haven't looked at the original Sextant in over a year. Is there anything I would need to add that has been changed? TO INSTALL: Download the latest version (v0.1) and unzip it in the "/Freeciv-2.5-?? ?/data" folder, to make it part of that Freeciv install. Alternately, locate your "/UserName/AppData/Roaming/.freeciv/2.5" folder, and unzip the file into there to make it available to all Freeciv installs. Last edited by Hans Lemurson on Sat Aug 18, 2018 2:33 am, edited 2 times in total. I cant answer any of your questions but since you are using the scenario I made: It looks fantastic! My biggest triumph was in getting Amplio2 cities to render on a 60x60 grid. Even once I got the orientation right, corners of adjacent cities were being drawn to the far left as well. I eventually declared in the cities.spec that the cities all have 32px "grid lines" between them and this fixed the extra-rendering problem. The cities still look a bit odd with their left corners missing, although this only really shows up with the city-walls. Their right corners protrude into the next tile making them look asymmetric until something else needs to be drawn in that square and the right corner vanishes. But still, it looks fine. My favorite innovation though was the Tile-Yield indicators. I was getting frustrated with how visually noisy the map was when they were on, but I like being able to see what the tiles are doing. I replaced them with fancier looking colored numbers, but either they were too small and strained the eye to read, or were too big and cluttered up the screen. So I thought "What about colored dots?" It went through several revisions, but I eventually settled on a size, orientation, and spacing which was readable while still being small and unobtrusive. An experimental enhancement to that was to take into account the fact that a 2-food tile is more accurately defined as a "0-surplus-tile". The first two food-pips are colored gray, and any tiles that produce less than 2 food have red pips to show that they are costing you food to work them. This lets you see how much food you're really getting from a tile, and makes the 3rd food look special. You can calculate the total food surplus of a city just by glancing at and around it. You have to add 2 of course, since the center tile is worked for free (and the graphics can't show that distinction), but I really like how it looks and works. I think that my Yield-Pip graphics could actually be adapted for many other tilesets as well. XYZ wrote: I cant answer any of your questions but since you are using the scenario I made: It looks fantastic! Well it's your fault I made the graphics. There was no way I'd play that scenario without them. My question is this: How should I go about Sharing/Publishing my Tileset? Hans Lemurson wrote: My question is this: How should I go about Sharing/Publishing my Tileset? Most people attach their custom tilesets to these forums as zip-files. What changes/additions would I need to make to have my tileset be 2.6 compatible? Hans Lemurson wrote: What changes/additions would I need to make to have my tileset be 2.6 compatible? Is it currently 2.5 compatible? Fortunately, GriffonSpade already made Sextant 2.6 for me! I'll just make a fresh modification and copy over my image files. Getting the Amplio cities to work in 60x60 though could be...challenging. 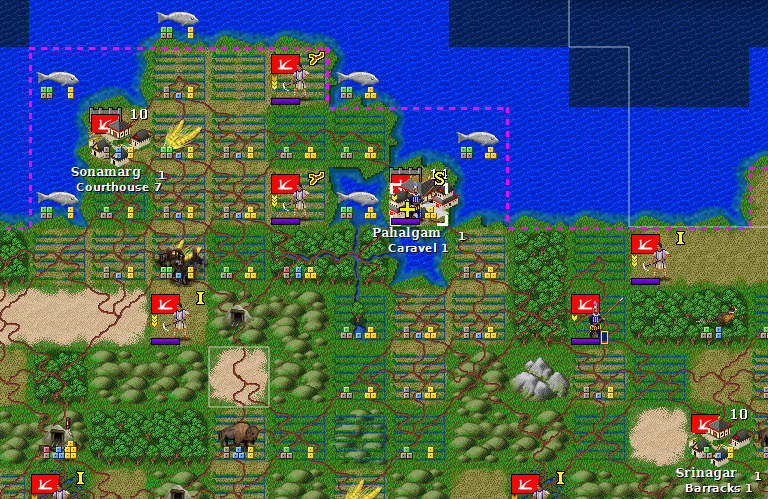 The Sextant cities.png contains a number of non-city sprites whereas the one from Amplio does not. I might have to actually learn how the new .spec files work. That's /exactly/ what I was thinking. Back in an older version of Freeciv there was BigTrident or whatever, but that just had stretched out tiles and had the fuzzy look going on. I felt I could do better, and there was no bigger version of a non-iso rectangular tileset than Trident, which can be a bit hard on the eyes. That said, that farmland /does/ look nice. I want to think of a better name for this tileset than "SextantHans" before I publish it. (I am assuming "Sextant" was a play off of "Trident" since it's 60px instead of 30px.) Any suggestions? In the mean time, I was forced to make my own 30px tileset based off of Trident, because a 60px tileset can't show enough of that HUUGE world map to be useful, and Trident makes my eyes bleed.